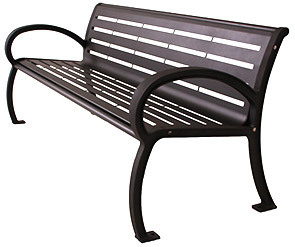 Offer comfortable and inviting seating with a selection of park benches from the Wilmington Collection featuring sophisticated accents, refined detailing and ultra-resilient finish. Designed for use in spaces ranging from indoor lobbies or hallways to outdoor parks or plazas. The stand-out style is highlighted by a modern horizontal slatted single-piece seat assembly, sleek arching armrests and precision crafted cast aluminum frames. Developed with footings specifically configured for both portable and surface mount applications, Wilmington Collection 4', 6' and 8' are built to offer comfortable, reliable seating that everyone can enjoy.